USB and DIN jacks for interfacing MIDI equipment with the µMIDI 1U module. Our 7U cases have the jacks built-in, this 1U Jacks module is for the rest of you. 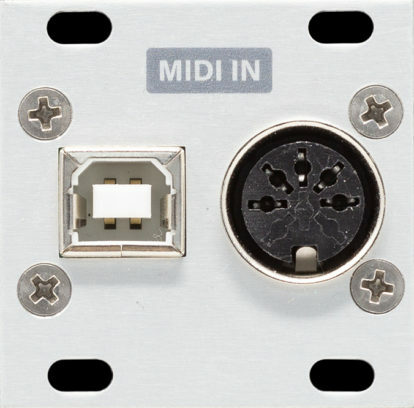 This module links to the µMIDI 1U module providing it with a USB connector and 5-pin MIDI input jack. NOTE: This module is not needed if you have the Intellijel 7U performance case, since that case comes with rear mounted MIDI I/O jacks and a USB connector.